Oil Refrigeration Machine - ! Equipment for Transformer Oil Reclamation. GlobeCore. 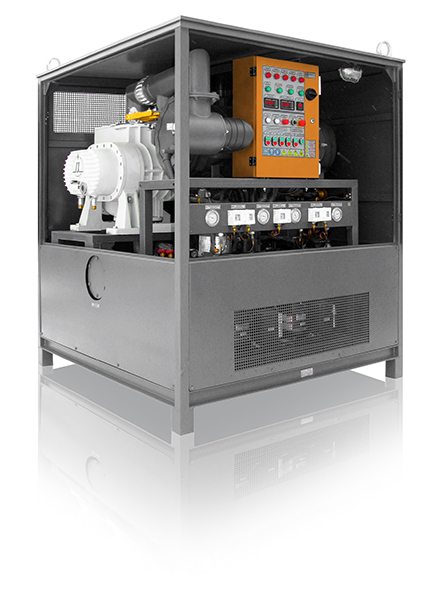 GlobeCore is proud to offer the INEY vacuum and refrigeration drying cold trap for processing of solid insulation in transformers in the range of 110 – 1150 kV. The unit is designed to be used for transformer installation, servicing, and repairs. GlobeCore manufactures three types of units that are different in terms of components, operation modes and specifications. All three types are equally good at performing their operations. Type one: single with double stage refrigerator capable of temperature to -70°C/-94°F. Type two: a composite unit with a vacuum pump; one module is a double stage refrigerator as described above, the other module is equipped with a backing pump and a liquid cooling and heating system. Type three: is a composite unit, one module is a double stage refrigerator, the other module is equipped with three backing pumps and a vacuum pump. Select the best option for your processing and service needs. Refrigeration section: 1 – compressor 1; 2 – fan 1; 3 – compressor 2; 4 – fan 2; 5 – solenoid valve; 6 – solenoid valve 1; 7 – solenoid valve2; 8 – compressor crankcase heating 1; 9 – compressor crankcase heating 2; 10 – evaporator; 11 – double channel pressure relay 1; 12 – double channel pressure relay 2; 13 – single channel pressure relay ; 14 – pressure and vacuum gauge “Input pressure” 1; 15 – pressure and vacuum gauge “Output pressure” 1; 16 – pressure and vacuum gauge “Input pressure” 2; 17 – pressure and vacuum gauge “Output pressure” 2; 18 – condensate drain valve. The unit operates in the following modes: COLD ACCUMULATION The surface of the evaporator decreases gradually to -70°С/-94°F. FREEZING After reaching the predetermined temperature of -70°С/-94°F, the system automatically switches to cyclic operation. EVAPORATOR DEFROSTING As moisture accumulates in the evaporator, it must be removed by defrosting. The defrosting process takes approximately 30 minutes. When the evaporator reduces the temperature in the cold trap to -70°C/-94°F, the difference of vapor pressure in the trap and over the solid insulation of the transformer (e.g. saturated water vapor pressure at +20oC is 2337 Pa, and only 18 Pa at -40oC), drives the water vapor from the transformer tank into the cold trap where it freezes in the evaporator. The duration of drying depends on how much moisture is present in the transformer, inside and outside temperatures, as well as residual pressure in the transformer tank. The unit can operate continuously for 20 days. A sight glass in the insulated cold trap allows for a visual observation of the process. A condensate drain valve in the bottom of the trap facilitates removal of condensation after defrosting. The unit is capable of trapping 7.5 kg of moisture in a 24 hour period. INEY System in Late Stages of Assembly This product is thoroughly certified with documents regarding the system’s quality and standards, just as any other product by GlobeCore. The manufacturing lead time of the unit is approximately 45 to 60 business days depending on selected options. GlobeCore provides effective solutions to the equipment needs of your company. Contact our sales manager for assistance in selecting the necessary options, sale terms and conditions, as well as commissioning and contract conclusion. During the manufacturing process, we welcome you to visit our facility and witness the process in person and learn more about your product and GlobeCore’s line of industrial equipment. When production is complete, the product is tested for performance and quality standards and is then shipped to the client. We are very flexible and work very closely with our customers to exceed their needs and standards.